Before we start crush garlic, green chillies, red chillies, peppersorn & cumin coarsely. Soak tamarind in warm water & rest it for 15 min & squeeze tamarind extract. Heat oil with ghee in a pan , temper with mustard seed,cumin seed, curry leaves, the crushed mix of garlic & peppercorns. Add in the tomato & turmeric powder & allow it to cook for a while. Add in the tamarind water & allow it to boil. Once the mixture is reduced to half add in the cooked toor dhal & mix well. Finish with chopped cilantro & serve hot with rice. This is a rasam totallu different than mine. I always wanted to know how they make garlic rasam...looks good! my fav... but i make it in a diff way..will try ur method next time! Different rasam..looks good n spicy.. 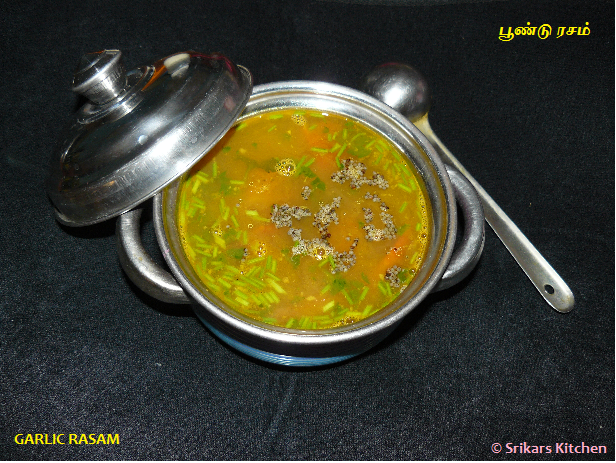 Different Rasam,Looks yummy,Thanks for the recipe and step pic. Even i use the same ingredients in a difference in adding. I add the crushed powder at the end before the first boil & turn off with a single boil. Check out my tomato rasam at sanghi-recipies.blogspot.com. That must be so flavourful and perfect for this weather. Rasam with garlic flavour, um yummm.Like your presentation. This is something demanding for the chilli weather. Looks spicy and aromatic. Love rasam of any kind,this one is so good!